Upon my desk is a computer monitor and there is a small television just to the left on the return. This enables me to easily consume all sorts of media. It does though on occasion present an interesting juxtaposition of information. I did not react well to that commercial. I am old enough now that I will speak aloud to the television which as a child I always perceived as peculiar adult behavior. Ah, another innovative product made in China - exploding watermelons. We have nothing like that in the U.S. Our watermelons, while delicious are unexciting because they just sit there waiting to be sliced and eaten. 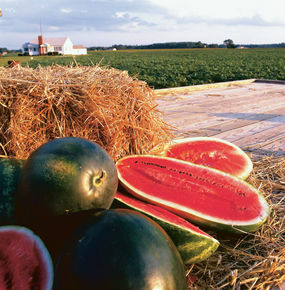 Wouldn’t exploding watermelons be perfect for 4th of July celebrations? We could place a few out in the yard after the barbecue, then place bets on which one will explode first. That might make a nice intro for the nearby fireworks display. Now while some consumers might like a watermelon that explodes after they purchase it, they don't appear to have any desire to purchase one that already exploded. 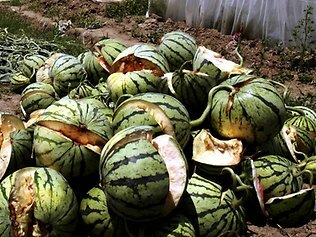 So these watermelon growers in China have thus far succeeded in producing nothing more than fish food. I think though that if they can perfect the timing of the explosion - they'll be on to something. The article reminds us of some other Chinese cost cutting innovations including rice with cadmium, milk with melamine, soy sauce with arsenic, mushrooms with bleach and pork with borax. Today, as I was contemplating writing this post, I learned that another new road collapsed in China. After all, why build roads that function for decades when you can build roads to function only for a few years? 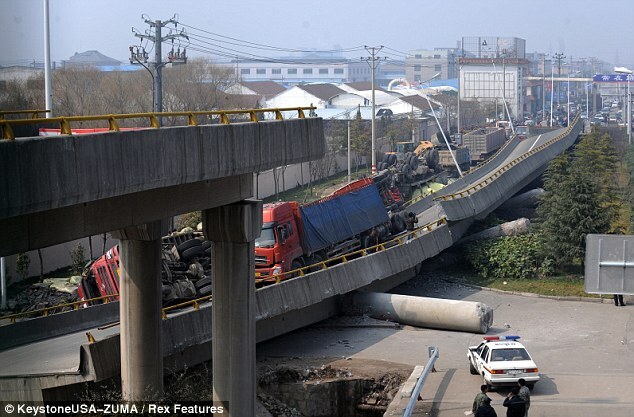 The roadway does not appear to be situated near any watermelon fields, so I suspect that inferior concrete or steel is to blame for the collapse. 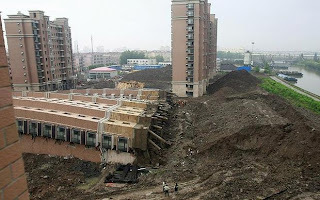 I am certain the collapse can be explained by yet another Chinese cost cutting innovation. Collapsing roads in China reminded me of the buildings in China that experience difficulty remaining in a vertical position. Watch any toddler long enough and you'll see that they too at times have difficulty remaining on their feet. Yes, gravity is a powerful force. Okay, at what point in time does China evolve into a country that can overcome the force of gravity and master what must be the fine art of growing watermelons that can't be confused with landmines? Hey iShare - invest in China? Consumer interest and desire of Made in USA products continues to increase and there is now an intriguing and informative series unfolding on ABC World News called Made in America. Unlike me, someone who completely furnished my home with Made in USA products across three decades, ABC tackled a more formidable project. They wondered if it was possible to furnish a home completely with Made in USA goods, today. I admit that today I simply could not replace everything in my own home without purchasing vintage products. As an example, my parents beautiful stainless waffle maker sits upon my kitchen counter and a new domestic replacement is not available in the marketplace. My own personal story can be found on our site here. Curious isn't it? How much is available today, domestically produced for our homes? Yes, there was a time when our manufacturing base kept the U.S. strong, self reliant and self sufficient. Simply, production is the means to create wealth and we produced our way to the status of the wealthiest country on earth. Bankers have a role in our economy, but throughout life I understood that my father with his lunchbox did more to create wealth than the boys on Wall Street who play with papers and who appear to excel only at wealth destruction. I've never, never, never understood those dimwitted and deviant individuals who convinced themselves and others that our country could somehow import its way to prosperity. Unfortunately, I could not include more than one video in a post, so please see below for additional videos with my comments. It was the Usry family that volunteered for the ABC series and in the clip below, they explore their home checking the country of origin on products they own. Made in America: What's In Your Home? I realize that many shoppers don't consider or check the country of origin prior to purchase. There are though, many shoppers like myself who always check the country of origin before we reach into our wallets. This series is focused on the importance of job creation but as a manufacturer watching this family explore their home checking products, I thought to myself - fire hazard... risk of formaldehyde... risk of cadmium... lack of durability... risk of lead, etc. This is an intriguing series and there is another video with my comments in the following post. I smiled when I saw the hunt begin for a U.S. made coffee maker. My head shook when they thought they found one. The Usry family is in for a very nice temporary household upgrade, as the products are on loan from the companies. Their home will be filled with American made products that deliver quality and safety, simply - they deliver a good value. I do suggest a visit to the ABC World News web page where you can view numerous videos, take a quiz, explore an interactive map, as well as find other engaging material. I'm delighted that our national media has seized an important topic and is undoubtedly raising awareness. This is an informative and inspiring series and is actually quite thorough. They stress the jobs that can be created by purchasing Made in USA products. As I've stated on this Blog, consumers are the force within the marketplace. Your every whim, interest, desire, curiosity, inclination, etc., once known will be researched, charted, graphed, and studied resulting in early morning meetings. It only takes a small percentage of shift in your spending habits to trigger those meetings. 30 years ago, before I was ever a manufacturer, I made a simple decision to buy American because I liked the idea that someone like my dad would get a paycheck from the money I spent. Supporting or creating a job for a fellow American appears to be quite altruistic, a trait I attribute to my mother. Across those decades though, I came to realize how much I had done for myself. My home is filled with products that deliver customer satisfaction, durability, quality, innovation, safety and value. Regardless of price, my purchases came with a lower cost to own. I am someone who is still using my parents waffle maker. Like them, I spend my money once and I'm done. When I consider folks who purchase imports and spend their money repeatedly, it actually appears quite extravagant to me. My suspicion is they somehow believe they are saving money. Huh. You will likely enjoy reading these five Blogs from people who have dedicated themselves to buying American. I'd like to tell you about my sort of business person. His name is Mark Andol and he's an American manufacturer. He lost a large client to a Chinese competitor and had to close some manufacturing locations and lay off workers which he found disturbing. Now in this situation a man like Jeff Fettig, CEO of Whirlpool Corporation would start to whine about his company's inability to compete in the marketplace. In 2009 during a recession, Mr. Fettig enjoyed a 77% increase in his compensation. Nice raise. In 2010, 1,000 Americans in Evansville, Indiana lost their jobs when Whirlpool moved them to Mexico. So that whole competition problem is solved now to Mr. Fettig's satisfaction, correct? Mr. Fettig is only mentioned again on this Blog because he serves as superb contrast to an inspiring and admirable American. 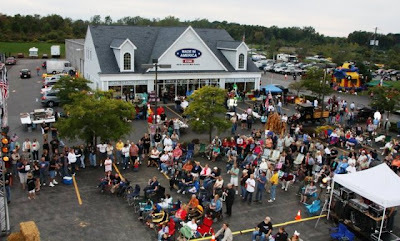 Mr. Andol reacted to foreign competition by investing $50,000 in a 2,000 square foot retail store in Elma, New York. He stocked that store with exclusively Made in USA products. The legal definition isn't quite good enough for Mr. Andol as he insists that every item in his store be 100% Made in USA including the packaging. Most of the employees Mr. Andol had to lay off he now employs in his store. His store launch was quite successful. The store is stocked with a variety of U.S. made goods as well as his own products. If you are in or near Elma, New York stop in to browse and shop. If you reside elsewhere in the country you can click the photo below and shop his online store. As an American manufacturer I can tell you that it's extremely difficult to get shelf space in large chain stores. Large retail chains prefer imported products because they come with a larger profit margin. It makes sense because there isn't quality, safety, innovation, craftsmanship, etc. built into those products. That leaves a greater margin for profit. No, the chain stores didn't pass on any savings to you, the consumer. This is the third brick and mortar store that we've found with exclusively Made in USA inventory. Other prudent merchants will likely embrace the same concept. With each new such retail location comes another opportunity for American manufacturers to find shelf space. This is the right direction. Well done Mr. Andol. Country artist Ricky Lee recorded a song that just might be my new favorite Country tune. Please visit our site to browse and shop the companies who can compete. Consumers who carefully check the origin of foods in their local markets, including organic foods, are more often discovering "Product of China" on the packages. Permit me to tell you a bit about food production in China so you can better determine if there is reason for concern. Farms operate under the strictest guidelines. Foods may not be genetically modified and must meet international food standards. Organic tea comes from the foothills of Tibet and is fresh, tender and flavorful. On the grasslands of Inner Mongolia hormone-free beef is produced. Rice is grown from specially cultivated seeds by experts from the Jilin Academy of Agricultural Sciences and is watered by the melted mountain snow of Mt. Changbai. These food products, which meet the highest standards are certified and stamped with a “Nation A” label. That sounds fine, doesn’t it? Is that the organic food that's exported to the U.S.? Is that the food that is available to the Chinese people? No silly, I’ve been describing the special food supply, reserved for high level Chinese officials. Are you now wondering why important officials in China might want and need their own secure and restricted food supply? Are you wondering that if the absolute best, safest and finest food products are reserved for the Chinese elite, then what grade food is exported to the U.S.? Restaurants in China have waste tanks and cooking oil is siphoned from the raw sewage in those waste tanks. That tainted oil is then refined and resold. As you would expect such an oil product contains toxins namely carcinogenic Aflatoxins. Since tainted and toxic recycled sewage oil sells for one half the price of untainted oil, oil producers in China blend the toxic oil with uncontaminated oil to increase their profit margins. China consumes about 22.5 million tons of cooking oil per year which includes about 2 to 3 million tons of waste oil. If this is what is produced in China for the consumption of the Chinese people, how much care do you suppose is taken with products that are exported to the U.S.? In 2008 China experienced a problem with melamine in dairy products. (Melamine mimics protein when tested.) A few children died and hundreds of thousands suffered from kidney disorders. Recently, the problem arose again and Chinese authorities seized about 64 tons of raw dairy materials. Farmers in China feed their dairy cows low quality feed. That inferior feed leads to low levels of protein in the milk, hence the introduction of melamine so the milk will meet the required minimum protein level. Despite prohibitions of melamine in dairy products, dairy producers still use melamine. You can see that the authorities in China have a problem. So, how might the authorities in China address the problem? Since it occurs to no one in China that perhaps dairy cows need better feed so their milk will contain more protein, the Chinese government has instead lowered the minimum protein level for dairy products to discourage the use of melamine. See, the problem is all fixed. At this point I have to admit, that as an American manufacturer I would never have conceived such a remedy for this problem, never. The U.S. and China both produce chicken, yet China imports chicken from the U.S. and we import chicken from China. At a glance that seems ridiculous until you consider that there must be a material difference in the products from both countries. Do you suppose that the U.S. produced chicken qualifies for a "Nation A" label? When you shop your local market and you stumble upon food products, including organics, that are a product of China, you are also likely to notice the familiar USDA logo as well as other logos on the packaging. Shouldn’t you, the consumer be able to find certainty and peace of mind in the certifications you find on packaging? That would be nice but it’s not exactly possible and I’ll explain. The USDA inspects food that is produced in the U.S. but it does not inspect imported foods. Unfortunately, the USDA certifies private inspection companies which may not be located in the U.S. Those companies may or may not certify food products from China. If they don’t inspect food in China which is possible and likely, then they rely on the certification from an inspector – wait for it – located on the farms themselves in China. And those inspectors are paid by whom? That inspector certifies the supposedly organic products to the middleman who certifies the supposedly organic products to the USDA and everyone’s logo and certification goes onto the packaging. This is the process which enables everyone in the chain from the farmer in China to your grocer to pretend that a food product from China is safe and possibly organic. This brings me to a recent email I received from a visitor to our site. From time to time I receive emails from folks who wish to share with me, their displeasure of foreign made products. I read the emails, nod in agreement and reply. The writer shared with me information about a fine fresh food product, found in my own refrigerator but the producer unfortunately licensed their brand name to another company who exports the U.S. product to China. Goodness knows I most certainly support U.S. exports, so this isn't necessarily unwise, except in this situation. The food product is then supposedly made into candy and shipped back to the U.S. packaged with a familiar and trusted brand name. The person who wrote to me had sound concerns about what possible contaminants could be introduced in China during the candy making process while I wondered if U.S. product ever actually made it into the candy. A food product suitable for my own refrigerator is one I consider “Nation A” grade. Detailed multi colored reports with graphs are nice, but they don't compare to what my own eyes witness. We've been conducting a full review of each department on our site. This presented the opportunity for me to visit some businesses I hadn't personally browsed in several months. I am the one who is most familiar with the inventory of all the companies we list. I'm very pleased to share my observations and conclusions. Keep in mind this involves domestic consumer products and this is happening in a down economy at a time when banks aren't lending. We removed only one link to a site that appears to be offline. It's possible that one company ceased operations but we'll return in the future to see if a new site appears. Many smaller companies have invested in their web sites and have redesigned them or added e-commerce. Some companies with attractive and well designed sites have further improved their web sites. The updates of a number of web sites now permit them to search in our Marketplace search. Those sites have since been added and their products can now more easily be found via that feature on our site. Many American manufacturers have expanded their lines. Some have even expanded their lines into other types of products suitable for listing in additional departments. My own company contributed a new product to the marketplace this year so we too are part of this trend. Many retail sites where a keyword such as "USA" was necessary is now unnecessary because those retailers have since added Made in USA departments to their sites. We've recently added to our site two new online malls that are filled with U.S. made consumer goods. We also came across several retailers suggesting to their visitors that purchases of Made in USA products be made early, prior to need because of increased demand for such goods. One retailer even described the increased demand as "extreme." We check many things related to the sites we list, including their traffic. The trend is up for nearly all sites, including other directories, Blogs & resources. This indicates to us that there is definitely an increased interest & demand for U.S. made product. There is willingness, even in a down economy, to manufacture in the U.S. and enter the marketplace. This is demonstrated to us by a growing number of new companies that we set aside for research & review prior to appearing on our site. Overall I see progress, growth and expansion with the American manufacturers & selected retailers we list and I am heartened. I'm looking forward to a full review of the remaining departments. I conclude that when you, the consumer, take the time and make the effort to purchase an American made product, you do much more than just snag a great product and a good value for yourself. That reason alone is really all the motivation a consumer needs. Given what I'm witnessing, the dollars that consumers traded for U.S. made goods supported American workers & American manufacturers and enabled them to prosper. When able to expand, such companies will expand and deliver additional U.S. made goods to the marketplace providing consumers with greater variety and selection of Made in USA products. Those consumers who shop for U.S. made product have actually invested in U.S. manufacturing. It appears that prudent and motivated consumers are a fine substitute for a negligent Wall Street. Now consider Mr. Griggs, a motivated consumer who invested differently in the marketplace. Mr. Griggs was a consumer with a need for a set of matching stainless flatware. He searched numerous big box stores and of course noticed the lack of a Made in USA option for flatware. Mr. Griggs understands the same as I, that consumers can not be expected to find the value in the marketplace if a Made in USA option is not present. The choice of one shoddy product from Country A and some other shoddy product from Country B is not a real choice. Where was the option for the consumer who is looking for quality and a fair trade for their money? Mr. Griggs faced a lack of choice. He knew though what he wanted, what the marketplace needed and what consumers deserved. He spent about a year working on a solution to his problem and he now has his set of matching flatware. It is manufactured in Sherrill, New York. He's now in business selling Made in USA 18/10 & 18/8 stainless steel flatware in 9 tasteful patterns. I have no doubt this flatware will make it from one generation to the next. While the review continues I will of course be shopping. Epicurean is now manufacturing kitchen utensils & coasters, Okabashi is now manufacturing children's footwear and The Three Weavers are back in business. American manufacturers seem intent on keeping me busy with updates to our site while tempting me with desirable product. Disclosure: Whirlpool Corporation is not a competitor to my own company. A company's reputation and public image is very important. Companies often spend a bundle to carefully craft their image for consumers and no company looks forward to bad publicity. A brand name is carefully developed and promoted with the hope it will embed itself in the conscious and subconscious minds of consumers. I cultivate and guard the reputation of my own brand as will my son after me. Whirlpool, the company and the brand enjoyed decades of consumer trust and regard. They are a splendid example though of how a brand is betrayed. I wrote a post in September 2009 about Whirlpool and there is now more to write about the company. Whirlpool is presently engaged in damage control. There is fallout from their decision to close their Evansville, Indiana plant. Whirlpool is not committed to U.S. manufacturing, precisely why they sit on our watch list. They've spent years closing U.S. plants and moving production abroad to low wage countries. They have several plants in Mexico where they will pay inexperienced workers $70.00 per week after they close the Evansville plant. Whirlpool is presently busy removing equipment & machinery from the plant and shipping it to Mexico. It does not matter that my company and the thousands we list on our site can compete in the marketplace. It does not matter that G.E. returned to the U.S. to manufacture appliances. It does not matter that Evansville extended numerous tax breaks to Whirlpool and community members, including Whirlpool employees actually subsidized the corporation. It does not matter that Whirlpool applied for and received $19.3 million taxpayer dollars in stimulus funds to offset their research costs. It also does not matter that Whirlpool enjoys about $19 billion per year in sales. Even though the rest of us can compete - what matters is that appliance giant Whirlpool is unable to compete, even with taxpayer assistance. Whirlpool Corporation can only afford $1.75 per hour employees. 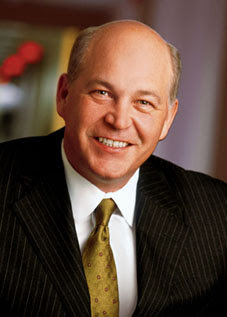 This is Mr. Jeff Fettig, CEO of Whirlpool Corporation. You and I know the buck stops at his desk but you'll have to excuse him because he's been preoccupied. Whirlpool Corporation is headquartered in Benton Harbor, Michigan. Ever since Whirlpool and other manufacturers moved production from Benton Harbor, the area has been in decline and a state of decay set in with high unemployment and poverty. The cruel and deplorable results of offshoring lay just outside Whirlpool's doors. Rather than witness & comprehend what their management & policies delivered to their fellow Americans, Whirlpool sought to remake the area as a community befitting a global corporation. Mr. Fettig, like the CEO before him wanted a "world class community" with a world class golf course. Mr. Fettig and a developer were busy for several years battling with local residents over a public park. In 1917, 73 acres of land situated on Lake Michigan were donated to the townspeople of Benton Harbor in perpetuity. It was known as Jean Klock Park. John & Carrie Klock deeded the property to the city in honor of their deceased daughter, Jean. The community treasured their park and fought for it but Whirlpool needed that lakefront property for their world class golf course. The majestic Lake Michigan views are now for Mr. Fettig and other Whirlpool executives to enjoy. The developer, Harbor Shores did receive at least 120 million in funding and tax incentives from the state of Michigan. To compensate for the community's reduction in public parkland, Harbor Shores swapped some other parcels of land for the desired public property. It turned out that those other parcels were contaminated with dangerous levels of lead, arsenic, volatile organic compounds, and polynuclear aromatic hydrocarbons. The Harbor Shores Board President is David Whitwam, retired Whirlpool CEO. I'm sure Mr. Whitwam considered a swap of contaminated inland parcels for pristine lake front public property a square deal. This is Mr. David R. Whitwam, Retired Whirlpool CEO, Harbor Shores Board President. Whirlpool insisted that the course would benefit the community. Per capita income for Benton Harbor is $8,965, the lowest in Michigan. If you are in the area and you'd like to play this course rather than the numerous other courses in the vicinity, schedule a tee time two weeks in advance and take about $175.00 with you - the cost of a round of golf. I have no doubt that such a course is a morale booster for Whirlpool executives. As I recall time spent at my club, the course is a relaxing place to discuss business. I don't expect any Whirlpool executives to catch a clue though by the 18th hole as they ponder ways to approach damage control. You see the 1,000 American workers in Evansville are understandably displeased with the closure of their plant. As Americans with strongly held views will do, they planned a demonstration outside their workplace. Upon learning of these plans, one of Whirlpool's executives laid down his golf club long enough to send a memo to those employees explaining that "these negative activities will only hamper employees when they look for future jobs." The purpose of the memo was to limit publicity and public awareness of Whirlpool's actions. Whirlpool prefers to discreetly export American jobs while reaching into taxpayers pockets. After all, they do have a brand to protect. Whirlpool attempted to intimidate their employees who held their demonstration anyway and have now filed a Federal case against Whirlpool with the National Labor Relations Board. "Ethics has also been a big issue in the press. Some companies and some sectors in particular have been hit very hard by ethical issues. Are you doing anything differently in this arena?" "We have had a long history, dating back to the beginning of the company, of being a very ethical and morally responsible company. It is part of our culture. We evaluate people on ethics. We have a very broad compliance and training program. We have a saying at Whirlpool: There's no right way to do the wrong thing. At the same time, we are a big global company. We have 70,000 people in 170 different countries. You always worry that someone somewhere could do something that is not appropriate." Next year, Whirlpool will market their new smart dryers which you, the American taxpayer helped finance. They will only cost you about $10.00 to $20.00 more and are expected to save you between $20.00 and $40.00 per year in electric costs. Sales are down for Whirlpool and they no doubt have high hopes for this innovation. By 2015 they will incorporate this technology into all their electric appliances they produce worldwide. This U.S. taxpayer funded innovation could improve sales for Whirlpool - well, unless someone somewhere did something that was not appropriate and hurt their brand. A General Store is a rarity in communities across the country - even more rare is one that is filled with only Made in USA goods. That is exactly the inventory that shopkeeper Deborah Leydig wisely chose to offer folks in her community of Barrington, Illinois. 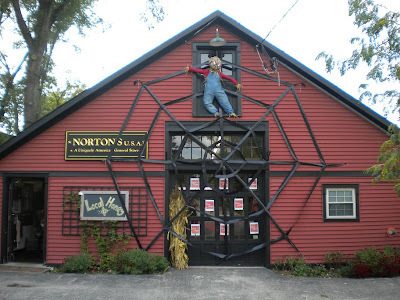 Norton's U.S.A. offers housewares, greeting cards, toys, glassware, jewelry, apparel, gift wrap, ribbons, china & much more. While there are numerous examples of online malls filled exclusively with US made products, listed here, this was the first example we found of a brick and mortar mixed inventory store that decided in favor of only US made goods. The second example we found was a shop called American Aisle. It's located in Round Lake Beach, Illinois. The two owners, Nitai Pandya and Mia Kenig-Bujnarowski cut the ribbon on their shop in December 2008. They offer their patrons Made in the USA cosmetics, toys, cutlery, kitchen items, wallets, hair accessories, lunch boxes & much more. 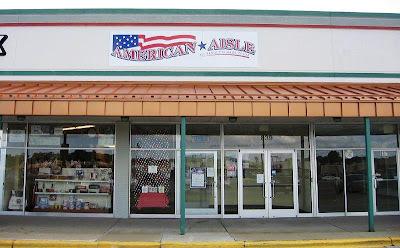 Fortunately for shoppers across the country, American Aisle has opened an online store so that we all might browse and shop a brick & mortar merchant that is devoted to supporting U.S. manufacturing. Their online store is now searchable in our Marketplace search. In my travels across the Internet, I've come across other people with dreams of opening a Made in USA store - a shop with only US made products. The two merchants noted above are demonstrating that such a dream is feasible. My own personal dream is an eco-friendly shopping complex with a number of different shops, each with distinct domestic inventory that meet shoppers various needs. I so thoroughly enjoyed adding American Aisle to our Marketplace search this day. It's strange sometimes, how dreams are realized in unexpected ways. Another occasion to smile as today I added Norton's USA new online store to our site and Marketplace search. FindUSMade.com is a comprehensive consumer built shopper friendly guide & resource for U.S. made consumer products. Our 25 categorized departments list thousands of locations for U.S. made products. We also list 17 online malls filled exclusively with only Made in the USA goods. We’ve listed dozens of searchable directories as well as many other online resources. By combining for the consumer these varied options, we hope to produce a powerful tool to enable shoppers to easily locate goods that are Made in the USA. The new Gateway to the American Made Marketplace© is a dynamic search of the prime locations from across the Internet with exclusively U.S. made products. It is virtually 100% free of imports. This new tool enables any shopper to quickly and efficiently locate a specific product and explore the bounty of American manufacturing. I am Mary, an American manufacturer and a consumer who has been buying Made in the USA products for the past 30 years. I am acting as the web person for Find US Made.com. (One member of our group is a tech expert and his skills are utilized when necessary.) I will usually be the one to update this blog about matters related to our site. We hope to create ease for our fellow consumers who seek goods & wares Made in the USA. Find US Made.com will remain apolitical to better serve our goal. As Black Friday Nears Remember to Shop American!! Wick-edly Sent Soap & Candle Co.
A Family Favorite, Anderson-Little Is Back!